Getting away from the rather bland and boring traditional chicken salad, a chicken and sugarsnap noodle salad is a twist on an old favourite and takes just 15 to 25 minutes to prepare. First soak the noodles before placing them in a heat proof bowl and covering with boiling water. Once the noodles are fully submerged in the boiling water leave to soak for approximately 5 minutes. After this drain the noodles and return them to the bowl and add the sugarsnaps, red pepper along with the basil before pouring half of the dressing over the salad and gently stir. Once on the plate add the sliced chicken breasts to the top of the noodles before adding the balance of the dressing to the salad. 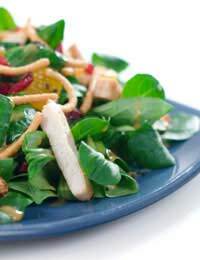 To give the salad an extra kick you may wish to consider adding a small amount of ginger that has finely grated. The dressing for chicken and sugarsnap noodle salad consists of olive oil, mayonnaise along with the zest and juice of a lemon, which is all blended together. If sugarsnaps are not your thing how about chicken noodle salad with pine nuts, bok choy and snow peas? This can be ready to eat in less than half an hour and is also an alternative to traditional boring chicken salads. You will also need to use 65ml of vegetable oil, 25ml of rice wine, 20g of white sugar and 10ml of lemon juice for the salad dressing. Blend the sunflower seeds, noodles and pine nuts with melted butter until everything is covered in an even layer of coating. Once this has been completed spread a thin layer of the mixture on a baking sheet. Then place in an already heated oven at 350 degrees Fahrenheit, 175 degrees Celsius or gas mark 4 and turn over occasionally until they are evenly toasted. Baking should last for approximately ten minutes and once baking is completed the contents should be removed from the oven and allowed to cool slightly. Using a large bowl, blend together the noodle mixture, onions, water chestnuts, chicken, bok choy and snow peas. The dressing is prepared by mixing the oil, soy sauce, vinegar, lemon juice and salad. Another twist could be to make a warm peanut dressing to go with your cold noodles. Heat some oil, ginger, garlic and chilli in a small pan for just a few minutes without letting it brown off, then turn off the heat and stir in some peanut butter and just let it melt. Then add approximately 5 teaspoons of water before reheating a little. Add some soy sauce and lime juice then let it bubble for a few minutes. To thin the dressing down you may need to add 2 or 3 more tablespoons of water.